These flavorful brats and sauerkraut with caramelized onions will be a favorite easy weeknight dinner or BBQ favorite! In a large skillet that has a lid, melt butter over medium heat. Add sausages in a single layer and brown 3-4 minutes on one side. Flip the sausages and add the sliced onions and allow the sausages to brown an other 3-4 minutes. Stir the sausages and onions and cook another 3-4 minutes or until the sausages are browned on all sides and the onions are beginning to reduce and caramelize. Add the celery seed, caraway seed, pepper, and brown sugar and continue cooking until the onions are golden and tender. Add the apple cider vinegar and mustard and stir to combine. Add the liquid of choice, bring heat to high until the mixture boils, then cover and reduce heat to low for 10 minutes. Increase heat to medium, remove cover, and simmer uncovered for 20-25 minutes or until the mixture is reduced and syrupy. Remove the sausages and keep warm (if you’d like, you can finish them off on the grill for a few minutes–this is a very tasty option.) Add the sauerkraut to the pan and heat thoroughly. 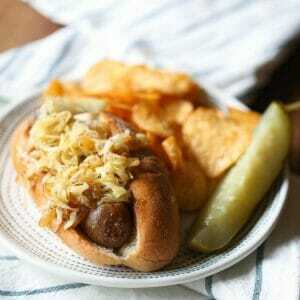 Serve the sausages on buns with caramelized onions and sauerkraut.